Industrial lighting made in Great Britain by Lumley Designs. Stylish Coolican industrial light created using traditional metal spinning methods here in the Black Country, finished in authentic, vintage and retro colours. 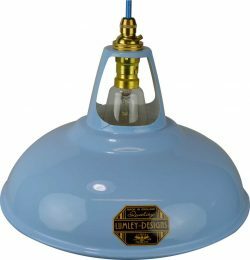 Our range of vintage style lighting is available complete with pendant, fabric electric cord in corresponding colours to match the shade colour and a choice of a brass or chrome bayonet fitting. Created with the iconic vented styled neck true to the original Coolicon light shade, Coolicon lights blends in beautifully throughout home interior, kitchens, bars, restaurants and contemporary living to complete the setting you are looking for and creates that timeless elegance only the Coolican lighting can provide.